Part 2 of 5. 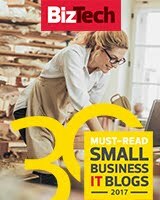 Need to read from the beginning? To get more familiar with the Geb Framework + Groovy Language + Spock Framework, I was planning on figuring out how to automate Dave Haeffner's Login page on his test site, The-Internet. A few days ago, I talked a bit about scaffolding a project, laying out the basic groundwork, and the history of Yeoman.io. With this blog post, we will walk a user through downloading and installing Yeoman through the Node Package Manager. The installation will be done on the command line: the Mac's Terminal or the Windows Command Prompt. Unfamiliar with the Command Line Interface? 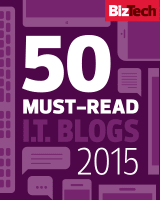 Read this blog post! Need a Quick Gradle Overview to do build configuration and run tests? We will be using a Geb Generator created by Chris Hluchan ( LinkedIn ), a Software Engineer at Google, formerly at Oracle. We will be borrowing heavily from "Let's Scaffold a Web App" written by Mehdy Dara ( Github: zckers ). Want to see what the boilerplate source code the Geb generator produces? I have uploaded it to my GitHub site at https://github.com/tjmaher/geb_project_generated_by_yo . The next few blog posts, we will be comparing that to the official Geb + Groovy + Spock Framework documentation to figure out how it works. First, we need to figure out how to install everything. Have you ever needed to set up a brand-new project but were not sure where to start? I am like that right now! Geb (pronounced "jeb") is a mash-up of jQuery, Selenium WebDriver, with the Page Object Model, Reporting, and taking Snapshots built in. Groovy is a scripting language language that I covered before in my blog, specifically when talking about using Gradle for build.gradle configurations. Gradle does a lot more than handle installing third-party dependencies such as Chromedriver when you want to spin up a new Chrome browser on your local machine. With Gradle, you can set up tests to be kicked off on the command line, just waiting to be fed into a continuous integration environment such as Jenkins. The Spock Framework follows a Given / Then / When / Expect framework found in Cucumber's Gherkin language format that is usually paired with Ruby. But how do I set all these tools up if I want to test ? How to get them all to work together? Should I just repurpose Sauce Labs Test Framework, Groovy-Geb-Spock-Selenium at https://github.com/saucelabs-sample-test-frameworks/Groovy-Geb-Spock-Selenium? 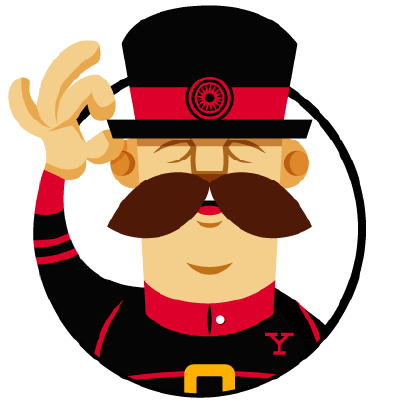 A new co-worker of mine referred me to a tool he had heard of at a previous job that may help: Yeoman.io. In the next blog article, we will be borrowing heavily from "Let's Scaffold a Web App" written by Mehdy Dara ( Github: zckers ) to walk through setting up your Mac or PC for Yeoman. We will also walk through installing a Geb Generator for Yeoman created by Chris Hluchan ( LinkedIn ), a Software Engineer at Google, formerly at Oracle. This will set up the project's scaffolding. How Geb works with Selenium WebDriver: entering text, clicking buttons, and capturing web elements in page objects. This blog article will talk a bit about the history of the Yeoman tool. I just started a new job on Monday at Good Start Genetics. Along with the new job came a new title: Software Engineer in Test. It's the first time in twenty years that I do not have the words "QA" in the job title. It's a brave new world. The funny part is that it was supposed to be another Senior QA Engineer position. By my personal timetable, I didn't think I would be able to make that leap for another three years. It was the coding test that did it. For the past two years, I have been coming up with random Programming Projects, trying to reinforce what I have been learning on the job, doing independent research, trying to put the tools and technology I was learning in the larger context of the software testing industry. Thank you for all the friends and family -- especially my wife -- who supported me during the last two months of intense job searching. Thanks goes out to Fitbit for setting me out on the path to being an automation developer. Thank you, James Moore for bringing me onto your team two years ago, setting up a month's worth of study sessions in Selenium WebDriver and Java. And thank you, Lark and Joon for coaching and mentoring me. And thank you, Steve, for giving me a two month head start to job search. 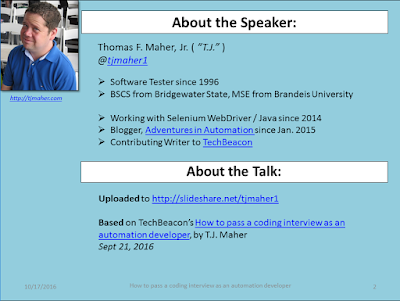 Beginnings of a new slide deck: "How to pass a coding test as an automation developer"
I haven't had this much fun drafting this new slide deck since my student job as a Graphic Artist / Desktop Publisher back at Bridgewater State's Davis Alumni Center! Back then I loved helping organize events, plan promotional campaigns, draft flyers, create T-Shirts and logos, plaster flyers I designed all around campus, and volunteer to set up chairs and join the student ushers. I never spoke at these events. I may have been a Computer Science Major / Theater Minor, but when I was on-stage, I was safely in the middle of the chorus as a performer, or backstage where my crippling stage-fright wouldn't kick in. I may have been able to goof around on stage in cute community theater productions in elementary school and junior high, but when I was in high-school competing for parts with budding professionals, I knew where my true talents lie. 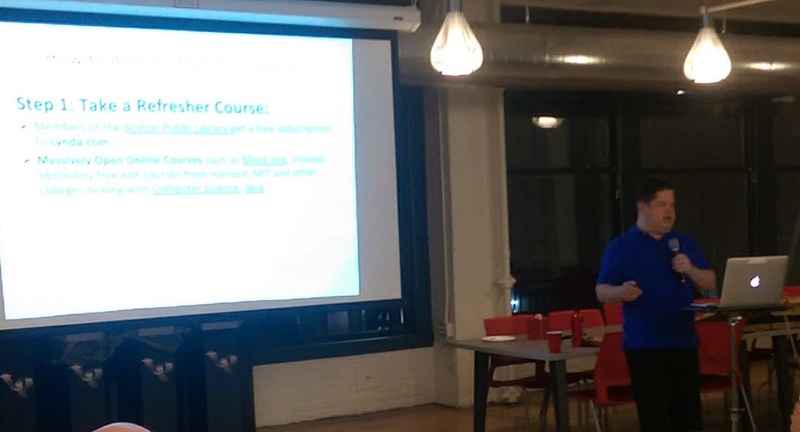 Oddly enough, I am pretty comfortable giving end-of-sprint product demos, no matter how many people are in the room. Let me have my cue-cards so I can keep the talk tight and on-track, and I am fine. Oh, I might need to spend a few years working through Toastmasters before I am anywhere near TED Talk standards. What do you think of the draft of the cover page and the title page? Leave your comments below! ... This Speaker Page was for people who are reading along at home, after the fact on Slideshare at http://www.slideshare.net/tjmaher1. I was going to upload the slides to my Slideshare account before the lecture. Mention to the audience when I reach this page that these slides are stored on Slideshare.net/tjmaher1. They can enjoy the lecture and don't need to take notes if they don't wish to. Hrm... I think "About the Speaker" and "About the Talk" should go on two separate pages. Thank you Gustavo Adolfo Rivera Yeomans! 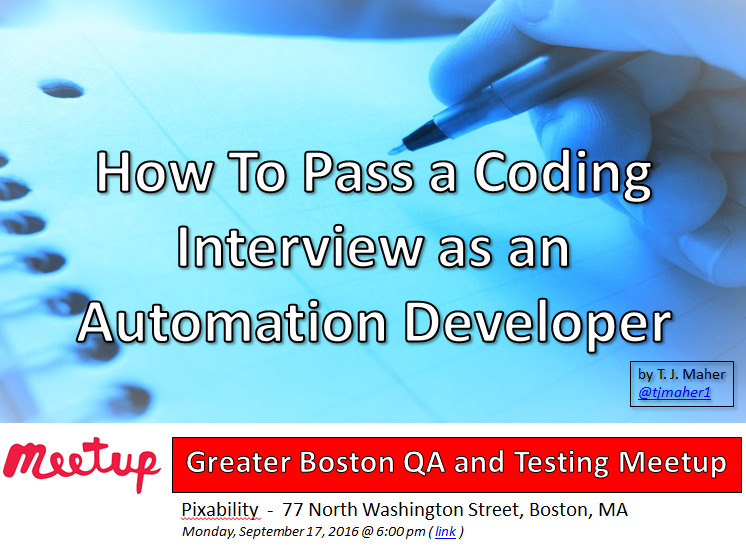 New speaking engagement: Monday, October 17, 2016: "How to Pass a Coding Interview as an Automation Developer"
I have a new speaking engagement coming up on Monday, October 17th, 2016 at a local QA Meetup here in Boston. 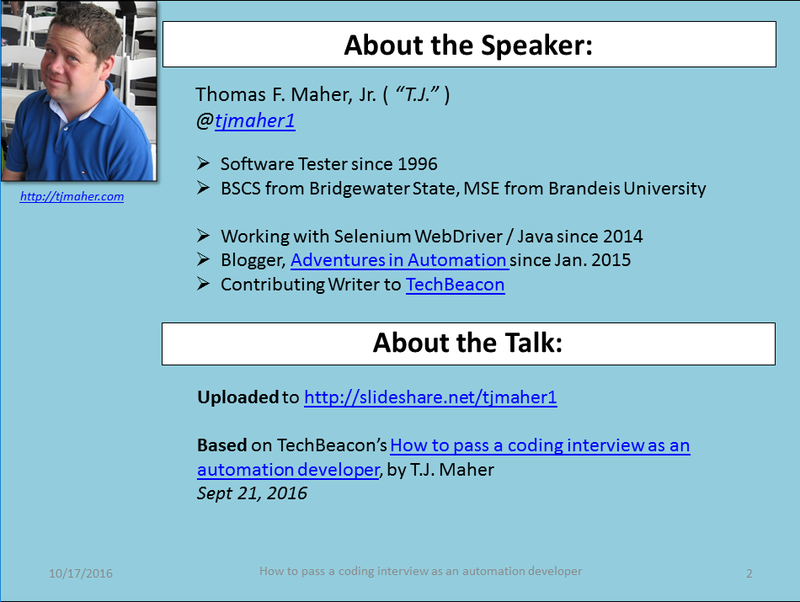 I am in the process of condensing my latest TechBeacon article: "How to Pass a Coding Interview As An Automation Developer" into a 30 minute talk. This is fun! Hectic, but fun! I haven't had this much fun -- or this much anxiety -- since I was a theater minor with a week to go before dress rehearsal, @hollomancer! Thank you, Conrad Holloman ( @hollomancer ) for inviting me! Not that I am fluent in Java yet, mind you. I found out the hard way that knowing how to use Selenium WebDriver with Java and being able to sketch out Java code on a whiteboard are two different things. But I have been getting better. NightWatch.JS was launched by Andrei Rusu from Oslo, Norway. Back when I spent my 2014 Christmas break taking Alan Richardson's famous online course on Selenium WebDriver with Java and dreaming about switching from being a manual to an automated tester, the rule of thumb was to pair the automated test framework (what used to be called a "test harness" ten years ago) with the web application.